We guarantee delivery around the world including Canada and European Union. We also guarantee the quality of our products. If any product received by you is damaged then kindly contact us for absolutely free reshipment. Q. What is our Shipping Policy? All transactions at Reliable Canadian Pharmacy are processed in American Dollars (USD). 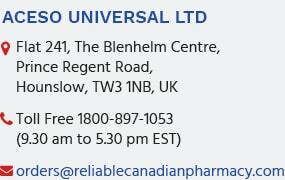 Reliable Canadian Pharmacy is committed to getting your order to you on time. Once your order has been received on our website or through Email or Phone. Your order is filled and then shipped to your selected destination. The average delivery time is 5 - 21 days. All orders qualify for standard shipping worldwide with an average delivery time of 5 - 21 days to addresses in the U.S., Canada and most European countries.